This is one of the true buchus, long used medicinally. The volatile oils in the glands dotting the leaves and fruit emit an easily recognizable buchu fragrance when touched or crushed. This evergreen shrub with aromatic leaves is used medicinally. 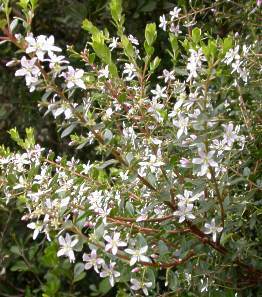 It forms a charming garden shrub with a rounded shape and grows to a height of 1.5 to 2.5 m. Starry white flowers, 1 to 3, are carried on short, leafless branchlets which form in the axils of the oval leaves. Flowers are 5-petalled, white or occasionally flushed pink. They decorate the shrub for 6-8 weeks between June and November. New shoots have distinctive red-flushed stems. The shiny, oval green leaves are twice as long (15-35 mm) as they are broad. 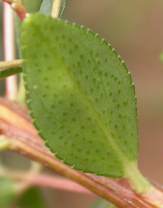 The leaves are opposite, have serrated edges and scattered oil glands on their undersides. Flowers are followed by green fruit, which darken as they ripen. 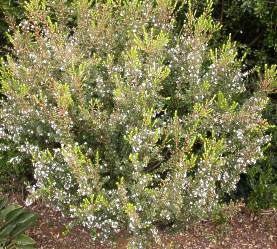 According to the Red List of South African Plants, Agathosma crenulata is assessed as declining. It has been heavily impacted by harvesting for essential oils throughout its range, and while a reduction in the number of wild plants in some populations has been reported, its estimated decline is not more than 20%, so it is not regarded as threatened. Legislation has also been put in place to manage the trade with the result that wild populations are no longer being harvested. Agathosma crenulata occurs on damp lower slopes of the mountains of southwestern Cape from Tulbagh to Riversdale. In nature it prefers the middle slopes, particularly on siltier valley or shaly soils and often near water. Natural distribution is Mountain Fynbos. Agathosma derived from the Greek meaning agathos, pleasant and osme, smell. Agathosma crenulata and A. betulina (see below) belong to the Rutaceae, commonly known as the citrus family. There are 150 species in the genus Agathosma and they are mainly found in the Western Cape. Barosma is an old name for Agathosma. 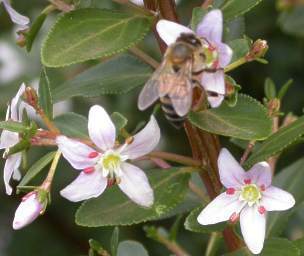 The entire shrub is covered in flowers attracting bees and butterflies. Fruit are formed after pollination of the flower. Seed are borne in a 5-chambered capsule, one seed per chamber. The seeds are ready to be harvested when the capsule turns darker in colour, feels harder and the bottom of the capsule is reddish brown in colour. The seeds are dispersed from the capsule upon ripening. This is known as ballistic dispersal. If intending to collect seed for propagation, it is important to inspect the seed capsules daily during the ripening period. To harvest seed, wait for a few capsules to open and collect the darker, plump capsules. Seed ripens towards the middle of summer, is usually during November to December. Seeds collected from fully ripe capsules show a higher germination percentage. If seeds are picked too early, the embryo will not ripen and the seeds will not be viable. Buchu is part of cultural heritage of the Khoi and San people who used the dried and powered leaves mixed with sheep fat to anoint bodies. Leaves were also chewed to relieve stomach complaints. Buchu leaves steeped in vinegar, boegoeasyn or brandy, boegoebrandewyn, were an essential part of the medicine chest of the early Cape colonist. They used it for a variety of ailments to treat stomach complaints, worms, indigestion, kidney and bladder ailments. Buchu vinegar was also used to wash and clean wounds. For a relaxing in the bath, tie a bunch of buchu leaves in some old pantyhose and drop it under a hot tap as you fill your bath. It helps to ease backache and rheumatism. Buchu is helpful when drunk as a tea, for urinary tract infection and mild digestive disturbances. It is also said to be an effective treatment for gout and rheumatism when taken daily. Prepare the tea by pouring a cup of boiling water over one or two teaspoons of dried or fresh leaves. Let it stand for 5-10 minutes then strain and drink. The best known method to use buchu is in the famous buchu brandy. Buchu brandy or vinegar is made by steeping a few thumb-length sprigs of fresh buchu in a bottle of brandy or white vinegar (optional add a few garlic cloves to the vinegar). Shake the liquid daily for a week and store in a cupboard. Agathosma crenulata can be used as an accent plant in your garden or as a filler plant in a mixed fynbos bed with companion plants such as Protea, Restio, Pelargonium and buchu. It can also be used as a container plant placed in a sunny spot on your stoep or patio. Planted in your garden this species requires full sun, soil that is acid, well drained and composted. Plant out in groups of 3 to 5 with enough space to grow. Add a layer of mulch to keep the soil and roots cool in summer, retain soil moisture and reduce weeds. Buchus are best planted out during the winter -spring season. Plants require good watering in winter and moderate watering in summer. Do not allow plants to dry out. Once established in your garden they will survive long periods of drought and will withstand a fair amount of frost. Agathosma crenulata is easily grown from seed. Propagating vegetatively from cuttings takes a bit longer and is difficult. The formation of calluses responsible for the development of roots is slow and cuttings tend to drop their foliage. Fresh seed is collected when ripe and stored for sowing in autumn. Seed is cleaned and sown on a prepared medium of sand and compost in equal parts in a seed tray. Cover seed with a thin layer of bark and water. Place seed trays in a covered area with good light and ventilation. Keep seed trays damp and germination will take place within 1 to 2 months. Seedlings are pricked out when 4 true leaves have developed. The growing tips of seedlings are pinched out to encourage bushy growth. Feed buchus regularly with a balanced nutrient. The yellowing of leaves can be treated with an application of iron chelate. Cuttings have the advantage of producing a larger flowering plant quicker than seedlings. Tip cuttings, 50-70 mm, are taken from the current year's growth. Prepare cuttings by making a clean cut below the node and remove the third of the foliage. Dip the base of the cutting in a rooting hormone. Firmly place the cuttings in a medium of 50% bark and 50 % polystyrene. Ideally these cuttings should now be placed in an well-aerated propagation unit with a bottom heat of 24º C. Ideally rooting occurs in 9 to 11 weeks. Carefully pot the rooted cuttings using a well-drained, humus-rich, fynbos potting medium (2 parts leaf mould, 1 part coarse sand). Plants will be ready for planting in 7 to 8 months. Feed regularly with a well-balanced nutrient. Agathosma crenulata and A. betulina are commercially grown for their oil. The oil is extracted and used in the manufacture of cosmetics, soaps, food colorants and medicinally for the treatment of renal disorders and chest complaints. Isomenthone and disphenol are the major oil compounds in the essential oils of A. betulina. The essential oils are used for their antiseptic and diuretic properties. Used in the food industry, the sulphur-containing compounds are responsible for the characteristic blackcurrant smell and flavour of buchu oil. A. crenulata is less desirable owing to high levels of pulegone, a compound considered to be toxic. Agathosma betulina is commonly referred to as the round-leaf buchu, rondeblaarboegoe (Afr.) It is a fragrant shrub growing to a height of 2 m. The leaves are rounded, about 20 mm long with a rounded apex curving backwards; they are rounder than the oval, more linear leaves of A. crenulata. Oil glands are prominent along the margins of the leaves. The flowers are star-shaped, white to pale pink in colour and flowers bloom from June to November. It is easily grown from seed. Agathosma betulina has a restricted natural distribution area in the Western Cape. It is found on mountain slopes near Niewoudtville, Piketberg and Tulbagh and in the Cederberg Mountains. GOLDBLATT, P. & MANNING, J. 2000. Cape plants. A conspectus of the Cape flora of South Africa Strelitzia 9. National Botanical Institute, Pretoria & Missouri Botanical Garden, Missouri. VAN DER SPUY, U. 1971. South African shrubs and trees for your garden. Hugh Keartland Publishers, Johannesburg. READER'S DIGEST. 1999. The healing power of vitamins, minerals and herbs. Heritage Publishers, Newlands. VAN ROOYEN, G. & STEYN, H. 1999. Cederberg, Clanwilliam and Bieudow Valley. South African Wild Flower Guide 10. Botanical Society of South Africa, Cape Town. VAN WYK, B., VAN OUTDSHOORN, B. & GIERIKE, N. 1997. Medicinal plants of South Africa. Briza Publications, Pretoria.